Last Sunday when the sun was shining we decided to treat ourselves to a well-deserved Sunday roast so headed to The Bell. We wrote a review of this pub back in the autumn when they first launched. You can’t reserve unless you are a table of 10+ and as they are very child friendly (children’s portions are half price) it can get very busy, so best to arrive early. They have now extended the garden area which is perfect for our lovely weather. 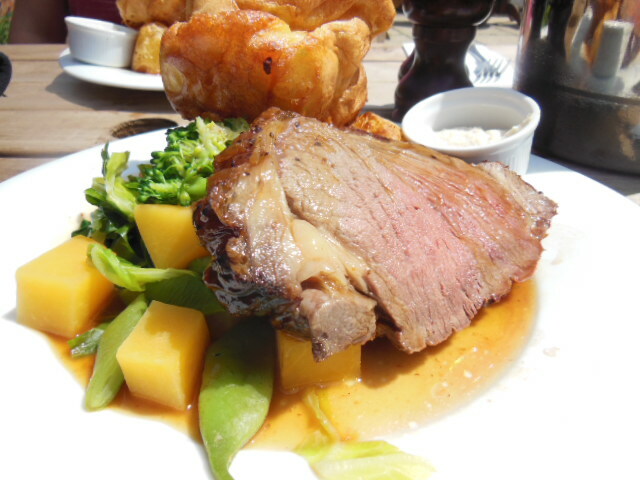 We chose a quiet table in the sunshine and ordered two roasts of sirloin, medium-rare. On our visit there was an impressive four choices of roasts (from £10.90-£12.90) – chicken breast, leg of lamb, loin of pork and of course the sirloin. If you want something different they do serve a kedgeree fish cake or you can choose a beef and bacon burger. For vegetarians there is a nut roast or spicy bean burger which we can recommend from a previous visit. Thankfully our food arrived speedily as we were starving (although this is not something new) and came with lots of well cooked vegetables – chantenay carrots, spring greens, swede, turnip, runner beans plus roast potatoes, homemade Yorkshire pud, lashings of gravy and a fiery horseradish. The beef was a tasty thick slice, served pink. Two empty plates headed fairly quickly back to the kitchen. Their focus is obviously getting plates of roast dinners out to hungry Sunday E17ers as starters were absent from the menu but there is plenty for those with a sweet tooth. I was pleasantly full with my main but I did spy my favourite summer pudding on the menu with clotted cream, also panna cotta, choc brownie and a naughty cheese plate if you really wanted a lazy long Sunday lunch washed down with a lovely bottle of red! This entry was posted in Pubs, Restaurants in E17 and tagged Bell, e17, roasties, roasts, Sunday, Sunday roast, The Bell, Walthamstow. Bookmark the permalink.